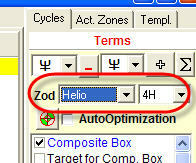 In this article some nuances of Astronomy module usage will be explained. For most financial instruments, we cannot use cycles of the slowest planets, because we have not enough price history data to make a conclusion as to how these cycles work. As an example, consider one of the longest historical data set available: Dow Jones Industrial index from the year 1789 till now. 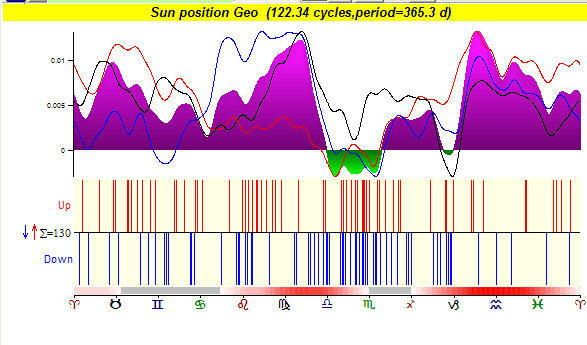 (The data before 1885 have been developed by Foundation of Cycles Research and Bill Meridian.) In total, we have 218 years of historical data to research the American stock market. 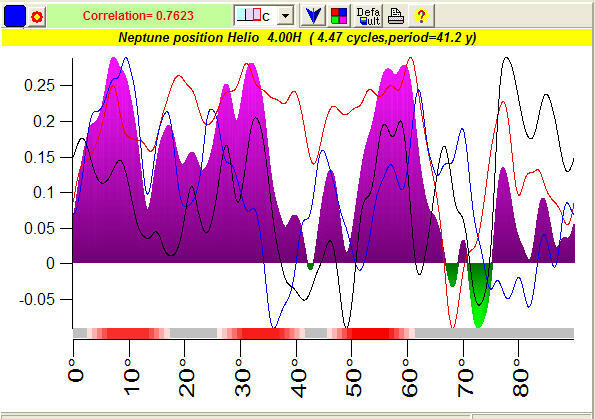 Unfortunately, we cannot use the Neptune cycle for these data as Neptune's 165-year period is too long compared to the available data. 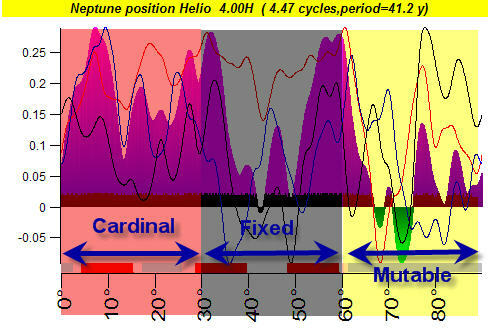 For a proper research on Neptune's cycle, we need at least 500 years of price history. However, there is a way out. We may apply some kind of analogy: let us assume that the impact of Neptune in Aries is similar to its impact in Cancer, Libra and Capricorn (the signs of Cardinal Cross). The impact of Neptune in Taurus is similar to Leo, Scorpio and Aquarius, etc. In other words, we research the impact of a slow planet going by crosses. As you see, there is some consistent pattern (split criteria) there, and this cycle provides a good projection line (see correlation criteria). It gives us some hints regarding gold prices, like when the Sun is in Fire signs (Aries, Leo and Sagittarius) the gold price goes up first two weeks and then it goes down. So we only need to know when the Sun ingresses the Fire signs (it happens around March 21, July 23, and November 22). The diagram represents how the market moves while the Moon makes 2 full cycles (i.e. 720 degrees). In other words, you can see at any moment of time how this composite works at that moment. 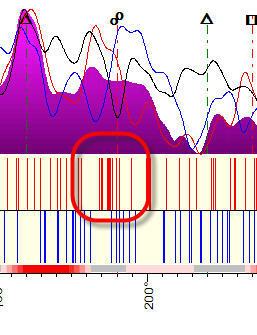 Also look at the chart attentively; there is a horizontal arrow as well. This arrow indicates the direction of the movement of this planet. The Active Zones feature allows you to get the answers to questions like this one: "Has the angle between Mercury and the Earth heliocentric any effect on DJI turning points?". 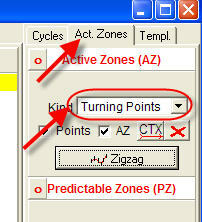 Click on "Zigzag" button to set the minimum swing for zigzag (that is used to calculate turning points). Let it be 15%. 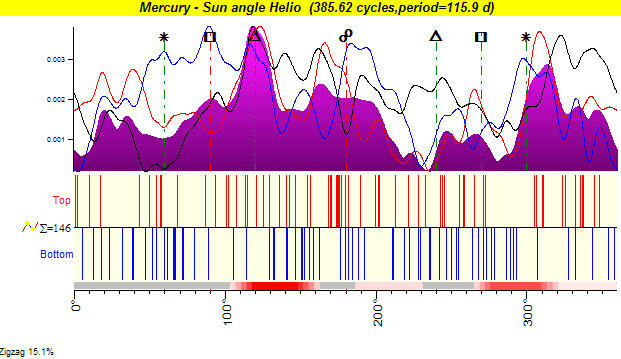 These stripes correspond to the top (red) and bottom (blue) turning points in respect to the angle between Mercury and the Earth helio (in heliocentric system, we use the Sun sign to designate the Earth). It means that this aspect may cause top turning points. There are practically no points around the opposition, but this effect means nothing as it is caused by irregularity of Mars's motion. All these features allow you to obtain the full astro portrait for any financial instrument. 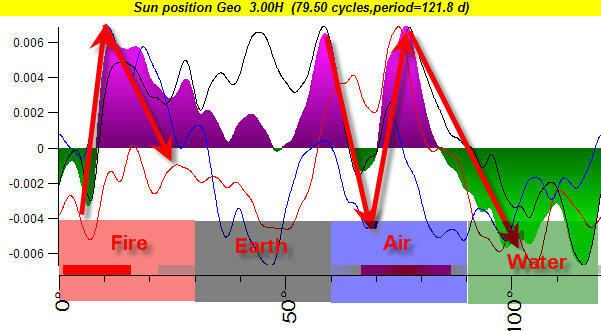 Next lessons will be devoted to calculation of the projection line based on these cycles. In other words the active zones here simply represent the irregularity of Mars movement. This effect appears very often, For practical use if we have dense zones for BOTH tops (red stripes) and bottoms (blue stripes) with high probability it means that we deal with planetary irregularity effect. 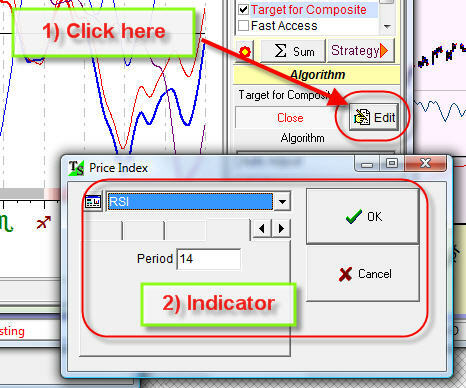 "By default" the program uses Relative Price Oscillator to calculate the projection line. This is obvious - to reveal cycles we need to eliminate trend component from financial data. Another important question is: "what period of oscillator we should use". 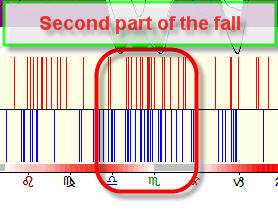 In other words, to calculate the 365 days cycle the program uses the oscillator with period 73 bars. 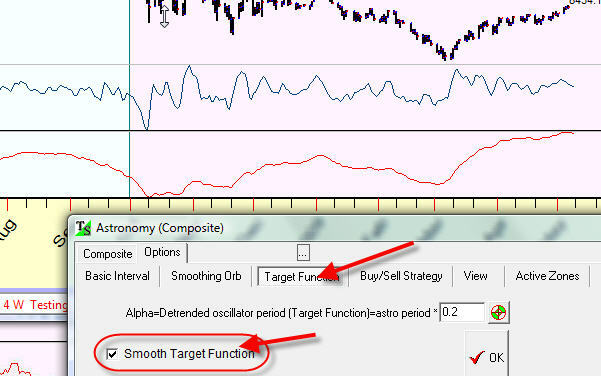 So the program uses long term oscillator to to reveal long term cycles and short term oscillators to reveal short term cycles. You see the red and blue lines became smoother now. One more parameter is "Alpha"
365 x 0.2 = 75 dyas.